Tank setup: Plenty of rocky decor with sand substrate (or fine gravel). 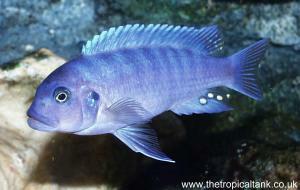 Compatibility: A fairly aggressive cichlid, it will not tolerate others of its own species. Keep adults as single specimens or established pairs. 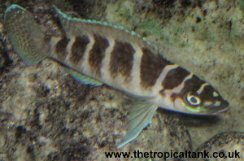 They are often aggressive towards similar-looking fish which occupy a similar niche in the aquarium, such as Julidochromis. 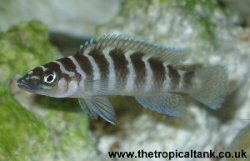 Suitable companions could include more robust Neolamprologus species, Altolamprologus, and shoaling Cyprichromis. Feeding: Will take most aquarium foods, supplement with frozen or live foods. Sexing: No obvious differences (see Breeding). Mature males are likely to be slightly larger. Breeding: To obtain a compatible breeding pair, it is recommended that a group of several juveniles are raised, and the 'surplus' fish removed once a pair has formed, to avoid serious aggression from the established pair. Spawning takes place in caves, which should have smooth walls to facilitate egg-laying. 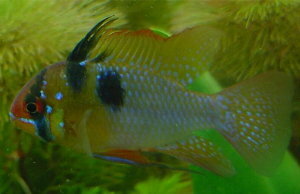 The female will protect the fry for a while after they emerge from the cave. Comments: There is some variation in the intensity of the stripes in fish from different sources. 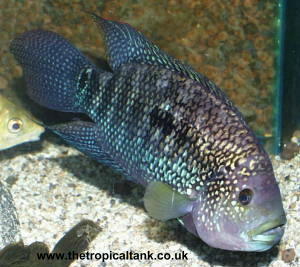 Although this fish is a slow grower, adults become quite an imposing fish at full size. 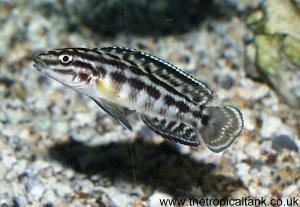 It is not recommended that they be housed with the similarly shaped N. leleupi, except in very large aquaria.